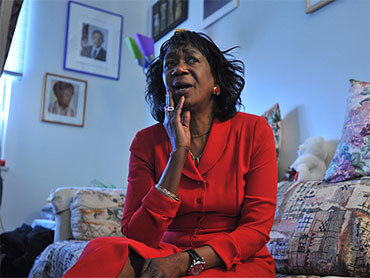 President Obama's Aunt Zeituni Onyango lived in public housing as an illegal immigrant for a time because the "system" took advantage of her, she said in a recent interview. "I didn't ask for it; they gave it to me," Onyango said in an interview with CBS affiliate WBZ-TV, scheduled to air tonight and Tuesday night. "Ask your system," she continued, unapologetically, when asked about the situation. "I didn't create it or vote for it. Go and ask your system." Onyango, the half-sister of Mr. Obama's late father, moved from Kenya to the United States in 2000. She first applied for asylum in 2002, citing violence in Kenya, according to the Associated Press. Onyango's request was rejected in 2004, but she stayed in the country, living in public housing in Boston. WBZ-TV reports that Onyango fell seriously ill but she did not have enough money to travel home after recovering. When it was reported in 2008 that Onyango was possibly in the country illegally, Mr. Obama said he had no knowledge of her status. As a presidential candidate, Mr. Obama told CBS News' Katie Couric that he was not against the possible deportation of his aunt. "If she has violated laws, then those laws have to be obeyed," he said. "We are a nation of laws." Onyango, however, told WBZ-TV, "If I come as an immigrant, you have the obligation to make me a citizen." Onyango was granted asylum earlier this year. For more of this interview, visit WBZ-TV.